Knowing where to start and how to proceed on a new capital improvement project can be overwhelming. Aside from lining up the obvious components—such as a design and construction team—there are thousands of details that need to be addressed, some of which can throw a project off the rails if they are missed. That’s where a trusted guide comes in. A trusted guide can help you navigate the complex territory of launching a construction project by ensuring that your vision is understood, that it will be carried forward with fidelity, and that nothing will be left to chance. This isn’t simply a matter of managing details and coordinating schedules. A trusted guide is also accountable for ensuring the on-time, on-budget completion of your project. The trusted guide approach begins by using the design-build method of contracting. What defines a trusted guide? We expand on some of the key qualities below. Perhaps the most important characteristic of a trusted guide is accountability. Many firms will promise to provide project oversight. But when an issue arises during construction, the finger-pointing begins. A trusted guide, on the other hand, is invested in the project’s outcome from the start. If a problem does arise, the trusted guide takes responsibility for finding the best, most cost-effective solution. This shifts risk from you to the construction team. It can also lead to a much more collaborative and satisfactory process because all stakeholders—the design team, the construction team, and the owner—work together to find the best path forward. A trusted guide will serve as a single point of contact to shepherd your plan forward from start to finish. Hand-offs are streamlined and there is less chance that key milestones will be overlooked because of assumptions that someone else has it covered. And when questions or issues arise, you have one person to contact who is answerable to you. Every project has unique nuances and challenges to work through. A trusted guide will ask the right questions upfront to develop a budget and project scope that meet your needs and remove barriers to achieving your vision. For example, if your budget and your desired project scope don’t quite align, a trusted guide can help you think through trade-offs in scope and materials to deliver a high-quality project for less cost. 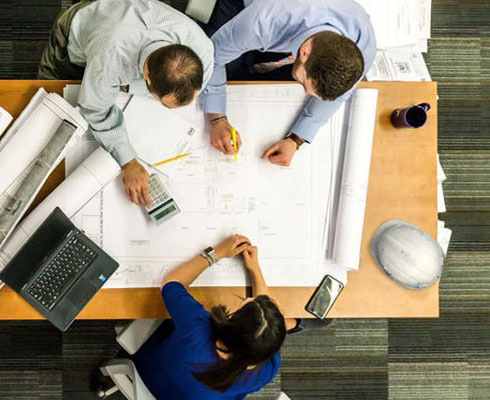 Value engineering can be built into the design, rather than worked out in the field so that there are no surprises when bids for materials and labor start coming in. And if you have an aggressive date for opening your doors, a trusted guide will take responsibility for ensuring that key milestones line up to support your ribbon-cutting date. When a project is just getting started, the financial focus tends to lean toward immediate and short-term concerns. Is financing lined up? Where does the budget stand? Are bids coming in too high? But after the project is closed out and you’ve moved into your building, long-term operating and maintenance costs come into view. A trusted guide that understands what it means to own and operate a building brings greater value to every project. For example, a trusted guide can help you think through how you will use spaces over the long term to provide greater flexibility for growth. An experienced guide can also help you avoid making decisions early on that will drive up lifecycle and even insurance-related costs later. Your total cost of ownership is never a question, which helps you make smarter, more informed decisions from the start. Above all, a trusted guide should provide you with a worry-free experience. At Miller-Valentine Construction, we set out to deliver on what we promise in a manner that provides total peace of mind. When our customers decide they need to renovate, expand, or build new, we are accountable for the whole journey. We prefer to be involved in projects at their inception because we understand how the decisions made early on shape the success of the project down the line. Our extensive preconstruction team helps our customers navigate all of the decisions that must be made before ground is ever broken. Our project teams draw from more than 55 years of experience across a wide array of industries and project types. And Miller-Valentine Group owns and manages millions of square feet of property, providing us with keen insight into what works best to minimize your long-term costs. All of this experience enables us to guide our customers through every angle of a project. The result? Creative solutions that are tailored to your specific needs and expectations. Ready to embark on your next construction project? Contact us today at 800-684-7687 to start mapping out the best approach, or e-mail Chris Knueven, President, at [email protected].